Rotterdam Dental Arts is a family dental office in Schenectady, NY. Dr. Yucedal and team work to provide a comfortable experience for patients of all ages. Incorporating preventive education and procedures to maintain dental health to conservative treatment for damaged teeth, we strive to restore oral health with aesthetic results. Our many services include cosmetic and restorative dentistry which includes restorations made by CEREC, an in-house milling machine that creates crowns and veneers in a single visit. We make every effort to schedule same day urgent dental care visits when calling during regular business hours. If you have an emergency after hours, please call our office number for instructions on how to contact our dentist for emergency dental help. 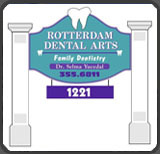 Rotterdam Dental Arts strives to make dental services more affordable for people to achieve good oral health. Our office accepts all major credit cards. We are in-network with many insurance plans and a complete list of these companies can be found on our financial options page. We also accept CareCredit, a financial payment program to help make their dental care more affordable. Rotterdam Dental Arts is located near the border of Schenectady and Rotterdam, NY on Altamont Ave. Our office is located between Flower Rd and Houlton Ave and is a convenient dental office for people in the surrounding areas of both Schenectady and Rotterdam. You may contact our office to make an appointment or request an appointment online.